This is a very interesting story of a Jehovah’s Witnesses worship house in the heart of Kiryas Joel. Kiryas Joel is the Satmar Hasidic satellite community in Orange County, New York, about an hour and a half from Williamsburg. The Satmar Rebbe Yoelish Teitelbaum founded Kiryas Joel in 1977. He had homes in Williamsburg and Kiryas Joel. Yet despite the complete insularity of Kiryas Joel, as little as five years ago there was a building in Kiryas Joel that was called a church, and it was surrounded from all sides by Hasidic housing. The worship house was active until about 2000, and then it was deserted for ten years. 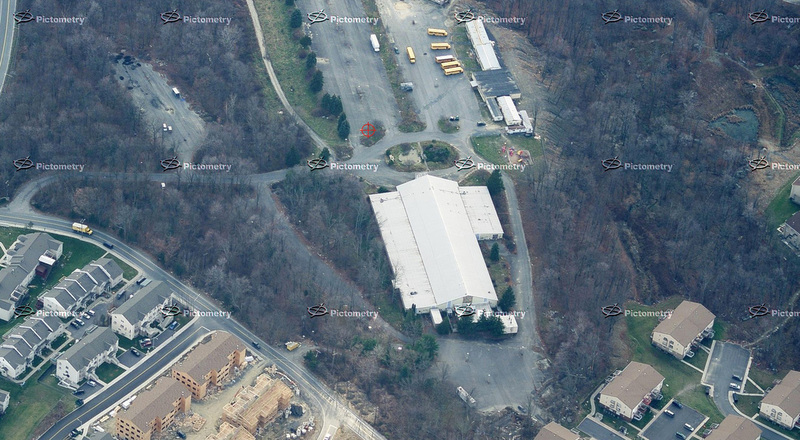 Here is an aerial view of the worship house in 2006. The white building is the “church” from behind, and you can see the construction of Hasidic housing nearby. On the Bing map you can see the worship house in red, the Kiryas Joel Yeshiva in blue and the Satmar cemetery where the rebbe is buried in yellow. I admit, what prompted me to look into the building was an old curiosity because of my childhood in Kiryas Joel. The “church” was actually right in back of my childhood home. I grew up on Satmar Drive, the street named for our sect. There was a large area of beautiful Hudson Valley woods behind us. It was broken up by a narrow road that led to what we called “The Tifleh”, a Yiddish term for Church. As a child I couldn’t actually see the church building because it sat deep into the path. Twenty five acres of woods surrounded it so I had no idea what happened behind the curtain of vegetation, but as a little girl I imagined it looked like any medieval church I encountered in stories about blood libels and bishops. I had heard that the church bells can be heard from Lizensk Blvd and it was all the proof I needed to imagine the church as a gray, towered medieval work of architecture. Everyone I speak to remembers the mass of parishioners that used to come every Saturday. Masses of busses and cars streamed out of the woods every Saturday. Because it was right behind my home, on long, sticky Saturday afternoons my friends and I clung to the yard fence to watch the cars leave the church. We even waved to every single car. It was great fun. We choreographed a practiced, cheer like motion for the wave: hang hand over fence, pick up, wave right to left, left to right, drop down. Repeat. Sometimes, someone waved back, and then we laughed and ran away, a little scared. Fast forward to about 2000, the cars stopped coming. We didn’t know it then, but the congregation had moved out. As far as I know, there was no conflict between the Hasidim and the religious group. I don’t know why they sold, but they sold for $2.5 million to a Hasid, and the price tag may have had something to do with it. The building then stayed vacated for ten more years, till about 2010 when it was demolished. The whole twenty five acre property was not cleared for construction until now – in 2014. I hear lots are now being sold for a quarter million a single family lot. It was built by Jehovah’s Witness in approximately 1972. The Witnesses are an unusual religious group. Relative to religion, this one is young, founded in 1870. The belief system is a radical offspring of Christianity. According to wikipedia, the Witnesses are known for their aggressive proselytization. They go door to door and ask if they can share a word about “the truth”, or Jehovah, or a passage from the Bible. They tend to be very insistent. They also do not allow blood transfusions, military service, celebration of birthdays and believe that everyone who isn’t a Witness is doomed. Their leaders have unsuccessfully predicted the end of the world many times, beginning in 1914. They meet about once a week or twice a week in a Kingdom Hall but it seems these meetings aren’t prayer services; they are more like sermons or bible study sessions. While most of their locations are Kingdom Halls, the one behind my childhood home was not. It was a much larger Assembly Hall, as it served many congregations from the tristate area. Every week several parishes took turns occupying the space. The members do not call their worship house a “church,” but somehow that is how Hasidim referred to it. 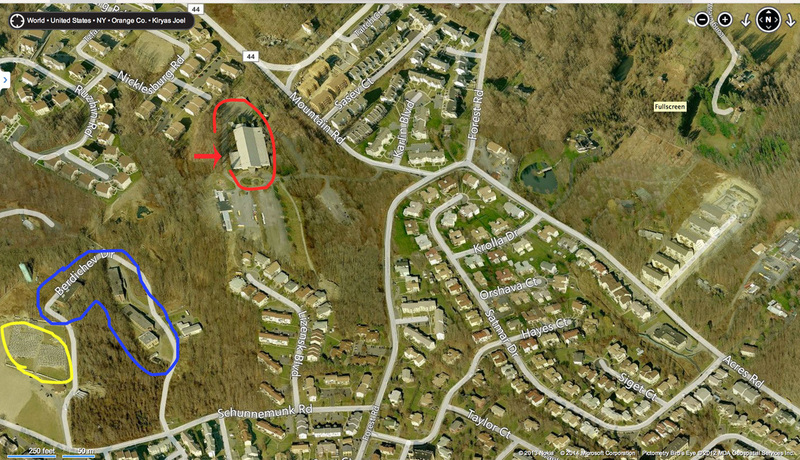 Here is a picture of the Jehovah’s Witness Assembly Hall that was active near Kiryas Joel from about 1970-2000. The photo was taken aprox late 1970. 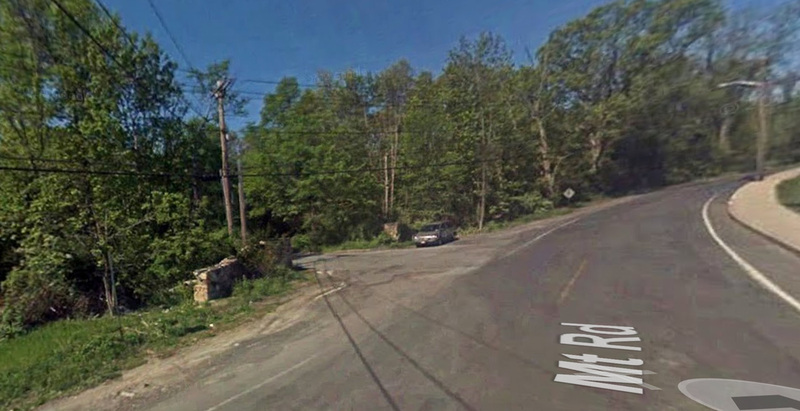 Because Brach was not aligned with the leading Hasidic village officials, he could not get the property annexed into the Village of Kiryas Joel, so it wasn’t zoned for multi-family homes. That’s why it wasn’t developed and the “church” stayed so long. In essence, the twenty five acre property was an island of Town of Monroe land in the middle of the Hasidic shtetl. We called the property Cheskel Brach’s Lot. During the ten years that the building was abandoned, I passed it many times. All the building markings of a worship house were removed. The previously manicured lawns were decrepit and the walls scrawled with Yiddish graffiti. This is the church when it was abandoned. You can see the water fountain is just a pool of muddy water. 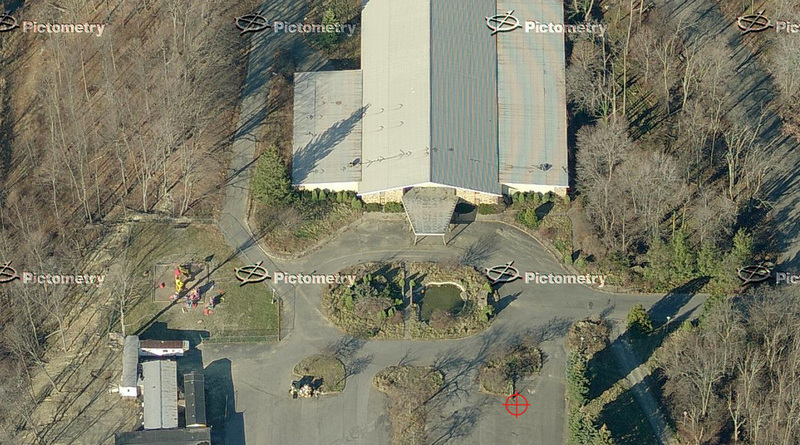 Notice the playground set up by Brach’s dissident school that was housed in trailers. The property was in the news several times when it was the site of incidents of arson. In 2003 and 2004 and 2004, among others. A former Jehovah’s Witnesses building just outside of Kiryas Joel caught fire yesterday evening, marking yet another suspicious blaze there in a year. This is becoming a common occurrence at the structure. Most recently, firefighters made two trips to the building on March 14 to douse suspicious fires. While inside, they found evidence of a fourth blaze that had gone out on its own. Days earlier, they put out another fire there. There was yet another suspicious fire in the building in May 2003. No arrests have been made in connection with the fires. 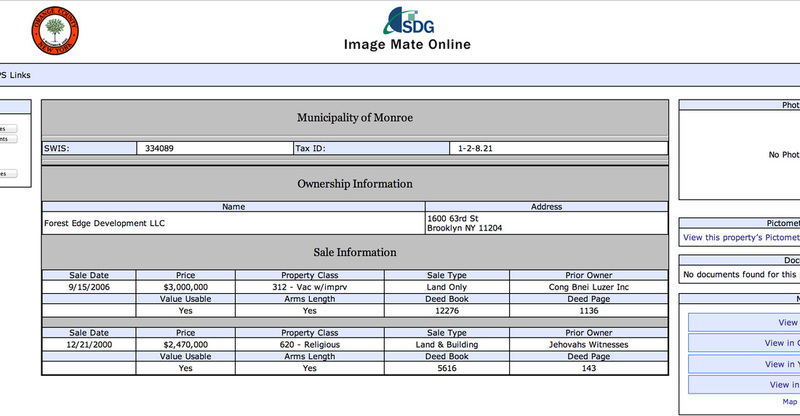 The building and surrounding 25 acres are owned by Zigmond Brach, a prominent dissident in the Satmar Hasidic community. Mahran said officials have been trying to talk Brach into boarding up the building, but so far no one’s had much luck. Several fire companies assisted at the scene of yesterday’s blaze, including Woodbury, Harriman, Washingtonville and South Blooming Grove. The existence of a worship house in Kiryas Joel, right next to the heart of everything, is incredibly unusual, and the particular group that gathered there makes it even more mindboggling. 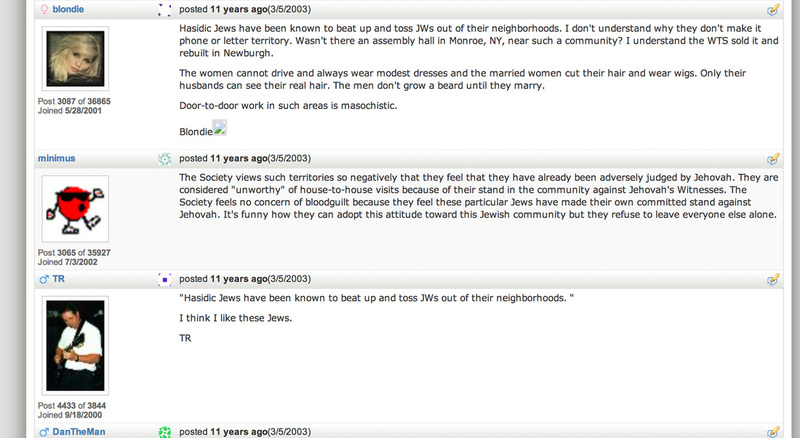 It’s interesting to read what the Jehovah’s Witnesses members thought of their center that neighbored Hasidim. What I heard at home as a child was that the “church people” were polite goyim and that they respected the Hasidic lifestyle. It seems they actually had more colorful opinions. From a forum from members of this faith and members who left their faith, http://www.jehovahs-witness.net, here are their comments. And one claimed that Hasidim were known to “beat up and toss out Jehovah’s Witnesses out of their neighborhood.” And that men don’t grow beards until they marry. Neither the comment about the beards nor about the women showing hair to their husbands is correct, and I know of no incidents in which Hasidim beat up any Jehovah’s Witnesses. Jehovah’s Witnesses sold to relocate elsewhere in Orange County, Newburgh, Tallman, Warwick, etc. They are now building their headquarters in Warwick.I hear that the twenty five acres that used to belong to Jehovah’s Witness are part of the request for additional five hundred acreage to be annexed to the Village. The Brach Lot is expected to be developed for Hasidic housing regardless of annexation.Soon, the site of the Jehovah’s Witnesses worship house that sat in Kiryas Joel for so many years will look like any other part of Kiryas Joel, and the story of the “church” will be history. But many of us, will remember the streams of busses and cars on Saturday.